EU “Everything but Arms” (EBA) initiative is leading to brutal forced displacement of Cambodian farmers. “They burned everything…including the rice. They didn’t allow us to harvest first. They said they wanted to grow sugarcane. They destroyed our houses so they could grow sugarcane.” (Widow, Oddar Meanchey province (1)). 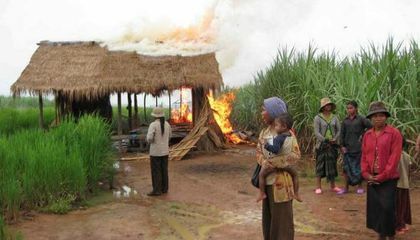 On January 24, 2008, three sugarcane plantation concessions totaling 19,700ha were granted in Oddar Meanchey province under Cambodia’s ELC framework (2) to Angkor Sugar Company, Tonle Sugar Cane Company and Cane and Sugar Valley Company; all subsidiaries of Thai sugar giant Mitr Phol Sugar Corporation (1). 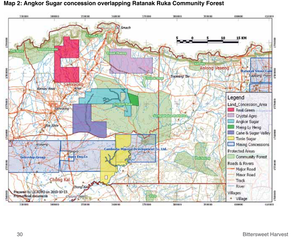 4,500ha of these ELCs overlapped with villager land from 33 villages (1) and the Angkor sugar concession almost entirely overlapped with community forests (3). 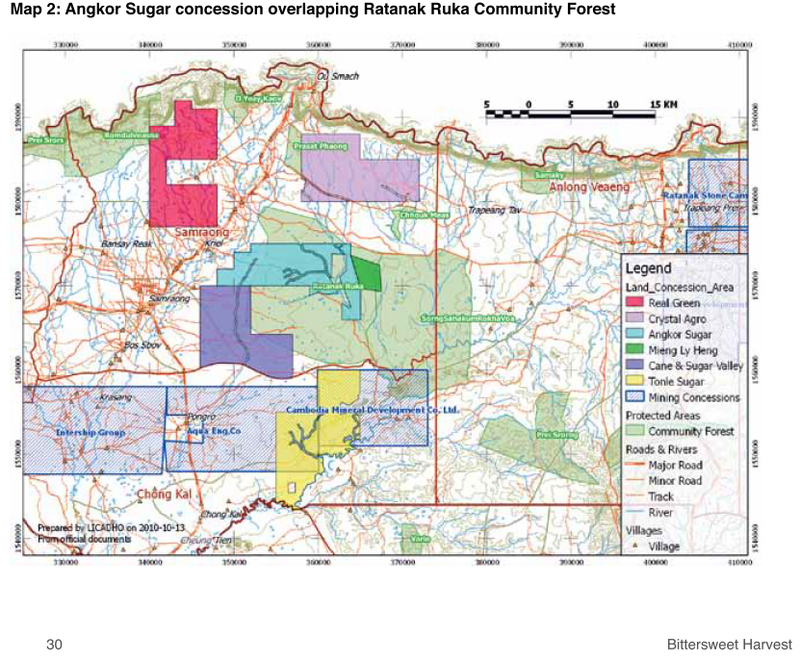 This land grab is part of a series of devastating land conflicts in Koh Kong, Kampong Speu and Oddar Meanchey province, related to Cambodia’s rapidly expanding sugar industry. This expansion is motivated by the EU “Everything but Arms” (EBA) agreement to support sugar trade between Cambodia and the EU, and legalized through the government’s Economic Land Concessions (ELC) scheme (2). In Oddar Meanchey, O‘Bat Moan and Bos village have been mostly affected and were completely destroyed. Previous to the land concessions, Bos village’s farmers settled in 1998, after the land was cleared from mines. Formal land titles for residential and farming land were given to villagers and land title ceremonies were attended by officials and forestry administration staff (1). In 2006, community forests, Ratanak Sambath and Ratanank Rukha, were established, supported by the EU and comprised by 16 villages, including Bos. Everything changed in 2008/2009, when the area was cleared and villagers forcedly evicted, without any prior consultation, impact assessment, or court order (1). In 2008, Staff from Angkor Sugar Company came to Bos village under guidance of local authorities and demolished 154 houses. Villagers were intimidated to accept compensation offers, if not they would face criminal investigation. The compensations offered however were inappropriate, offering smaller land plots than previously owned (1). In October 2009, O’Bat village was sealed by forest administration officials and Royal Cambodian Armed Forces (RCAF) to block the entry of human rights workers and media. Around 150 police, military police, RCAF troops and private army Batallion 42, financed by ruling party senator Ly Yong Phat (1), entered the village and completely destroyed 100 houses. Some farmers were arrested and a young villager was beaten unconscious (1). Villagers were forced to fingerprint statements that they voluntarily burned their houses and had accepted the compensation; resistance was responded to with with violence (1). At least 214 families lost their homes and were resettled to inadequate areas, which, according to villagers, were potentially covered by land mines. Dispossessed people from other villages received only 10 to 30% of replacement land, of which parts were occupied already by other villagers. No cash compensation was offered. (1) Large human rights abuses have been documented and impacts on livelihoods were devastating (1). Evictions occurred just before harvest, leaving all evicted families without food or income. Resettlement areas lacked shelter and appropriate infrastructure such as adequate access roads, making education and health-care difficult to access. Common property resources such as forests were degraded. Farmers lost their most important livelihood assets – land – and many were forced to illegally migrate to Thailand in the search for other opportunities (1). Investigations and support was repressed by local authorities. In March 2013, auditors from the Coca Cola Company, of which Mitr Phol has been the third biggest sugar supplier, were only allowed to visit the area under police escorts, for which reasons investigations could not be properly undertaken. In September/October 2014, staff from NGO Equitable Cambodia (EC) and investigators, who visited villagers to process a formal complaint against the companies, was intimidated by the police and detained overnight in the local police station. Interviews with villagers were stopped and EC was told they were not allowed to meet villagers without a formal permission from local authorities, which is obviously not supported by Cambodian law (4;5). Nowadays, the conflict goes on. Villagers have lost their livelihoods and haven’t received justice so far. Project Details The European Union (EU) has supported the sugar industry through the agreement “Everything but Arms” (EBA) with least developed countries (LDC) such as Cambodia. Companies operating in Cambodia can access the European market without tariffs and at a minimum guaranteed price. For sugar, the minimum guaranteed price has been on average three times the world-market price. While the extent of Sugarcane plantations in Cambodia was negligible in 2006, in 2012 it amounted to more than 100,000 ha. Cambodian sugar exports jumped to 13.8 million$ in 2011, 92% of which was exported to the EU (1). All companies are related to Thai Mitr Phol Sugar Corporation and contracts for the three concessions were signed on the same day. Hence, the legal limit for ELCs of 10,000 ha per company was surpassed (1). Mitr Phol Sugar Corporation (MPSC) is Thailand’s leading producer of sugar and bioenergy (3). While at the time of granting, 4,500ha of concession land overlapped with farmers land from 33 villages, land was classified retroactively to State private land, on august 23, 2012 (1). Mitr Pohl stated that the associated Cambodian companies are expected to produce 100,000 tons of raw sugar per year (1). In 2014, the Coca Cola Company disclosed that Mitr Phol has been among their top three sugar suppliers. Coca Cola has started an audit to investigate human rights abuses by their suppliers (4). Equitable Cambodia, Cambodian Human Rights and Development Association (ADHOC), Cambodian League for the Promotion and Defense of Human Rights (LICADHO), Sahmakum Teang Tnaut (STT), Cambodian Center for Human Rights (CCHR), LICADHO Canada, People's Action for Change (PAC), Inclusive Development International (IDI), Cambodian Human Rights Action Committee (CHRAC), Community Peace-Building Network (CPN), Coalition of Cambodian Farmer Community (CCFC), Diakonia, Indigenous Community Support Organization (ICSO), Building Community Voices (BCV), Cambodian Food and Service Workers' Federation (CFSWF), Cooperation Committee for Cambodia (CCC), Housing Rights Task Force (HRTF), Norwegian People’s Aid (NPA), The NGO Forum on Cambodia (NGOF), Banteay Srei, Cambodia Indigenous Youth Association (CIYA), Highlander Association (HA), Asian NGO Coalition for Agrarian Reform and Rural Development (ANGOC), Heinrich Böll Stiftung. To the EU: that EU should investigate impacts; temporarily suspend EBA trade; verify that producers are not involved in Human rights abuses or environmental destruction; ban import of agricultural goods produced on illegally acquired land, among others. To The Cambodian Government: Enforce the moratorium on new ELC; assure that the required social and environmental impact assessments are conducted; cancel concessions that violate human rights; support dispossessed families in returning to their land; return illegally granted concession land; and stop state military-backed up evictions, among others. To the involved companies: Stop forced evictions; stop destruction of community natural resources; stop using violence against people; return illegally appropriated land; stop using child labour, among others. Why? Explain briefly. The project goes on at the cost of communities and the environment.